cross-country road trip | We Have Twins?! 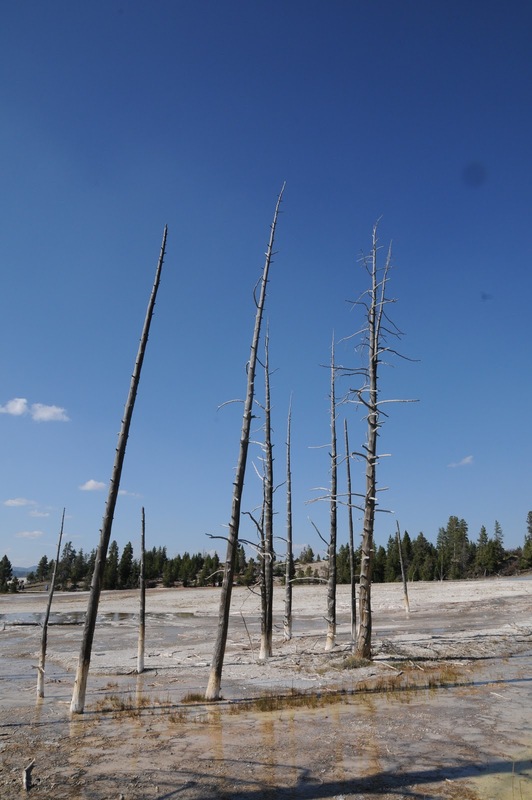 I can’t lie, I was disappointed to be anywhere after the day at Yellowstone–anything was going to be a letdown. 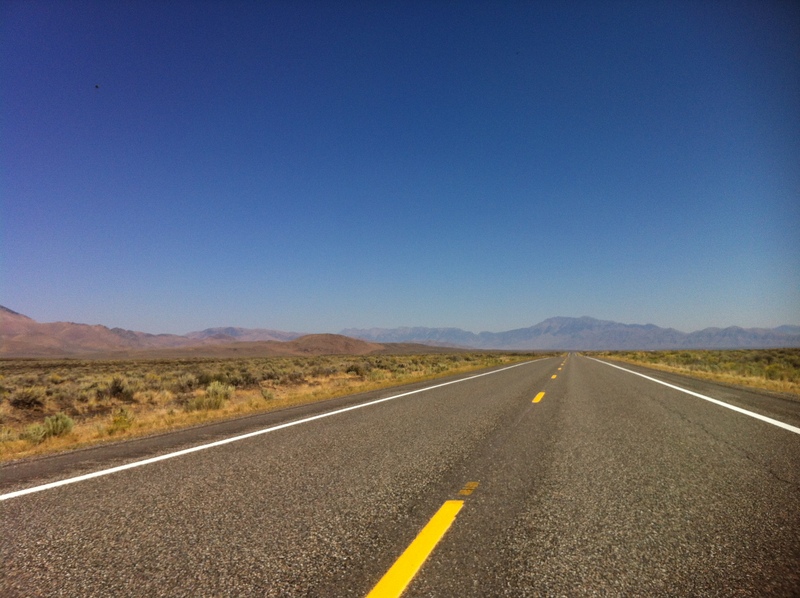 The fact that there is a whole lot of nothing in Idaho does not help. 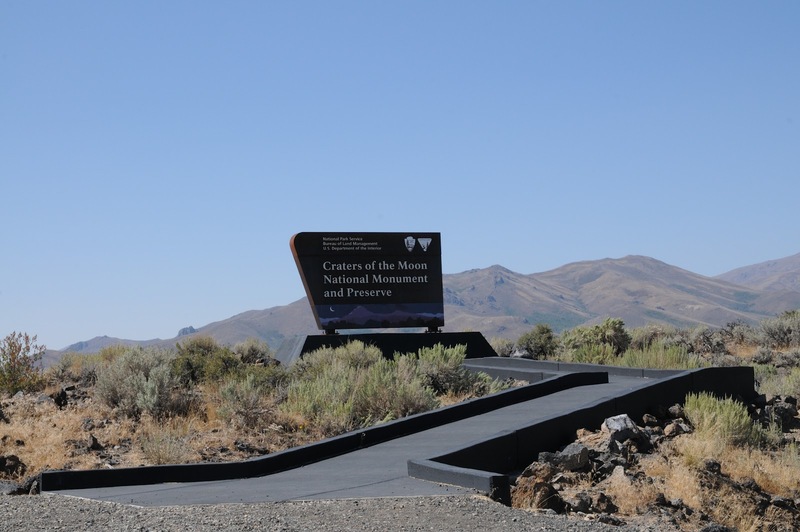 We took I-20 to Craters of the Moon National Monument. 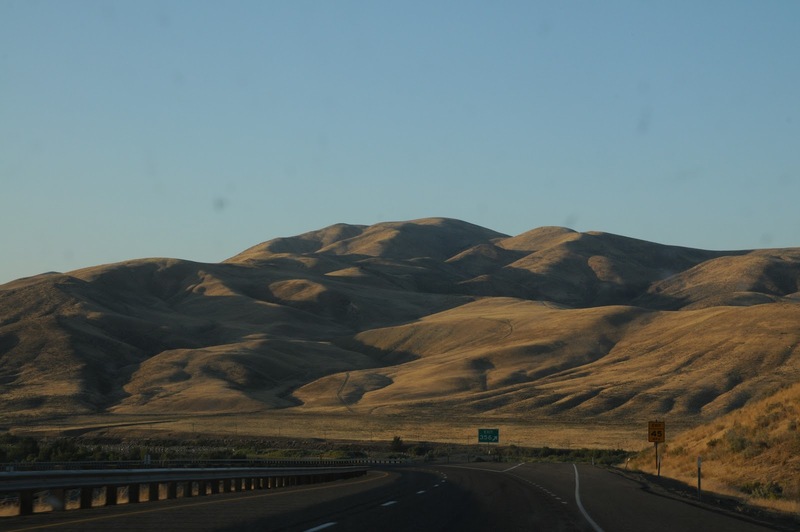 The road went straight for awhile and then skirted a series of brown mountains. 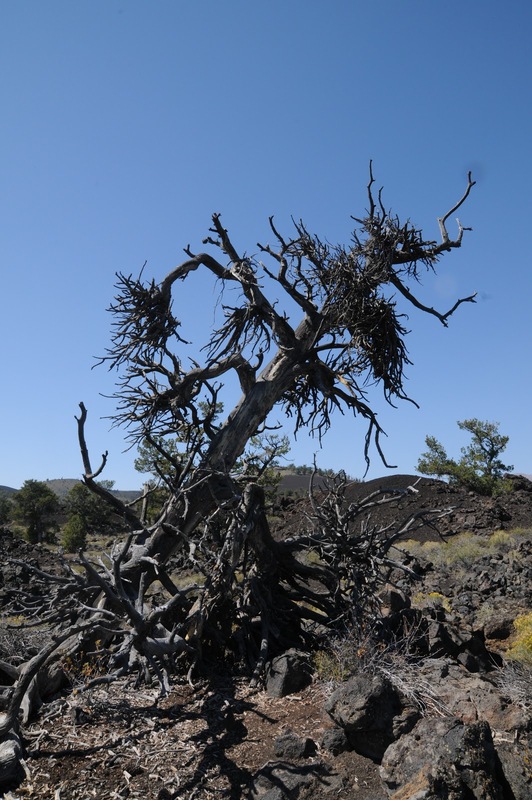 Eventually we got to Craters of the Moon National Monument. Spoiler alert: it was still empty! This is where a series of volcanoes erupted/exploded all over the plains of the Snake River basin. The mountain-y bits are still technically there, but they’re really small and unassuming. One would not guess that they barfed endless fields of lava for miles and miles. 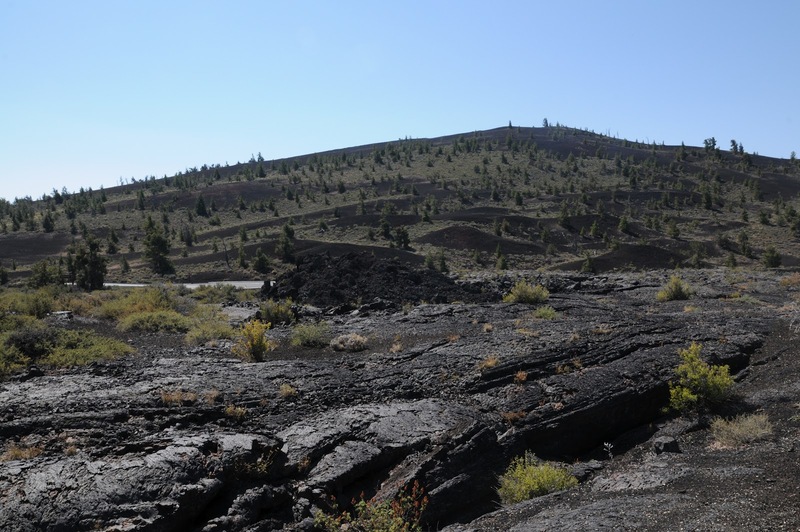 Seriously, endless miles of lava and nothing. 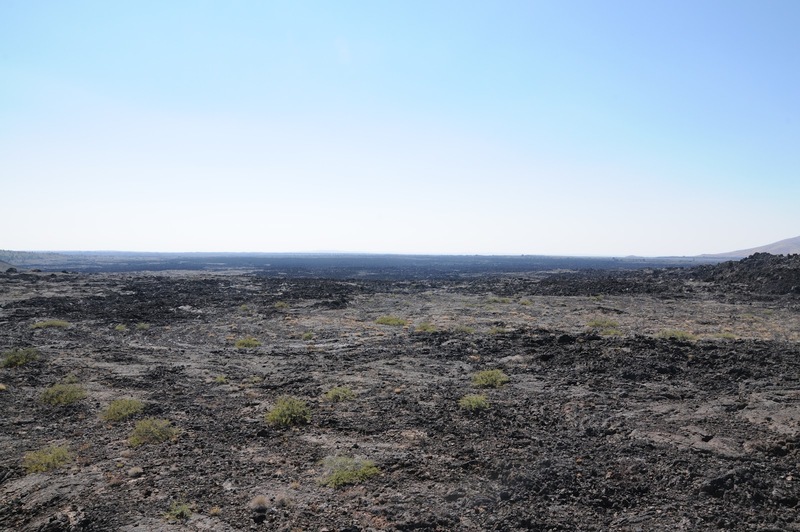 After a couple hours looking at various views of lava, we continued our journey westward. 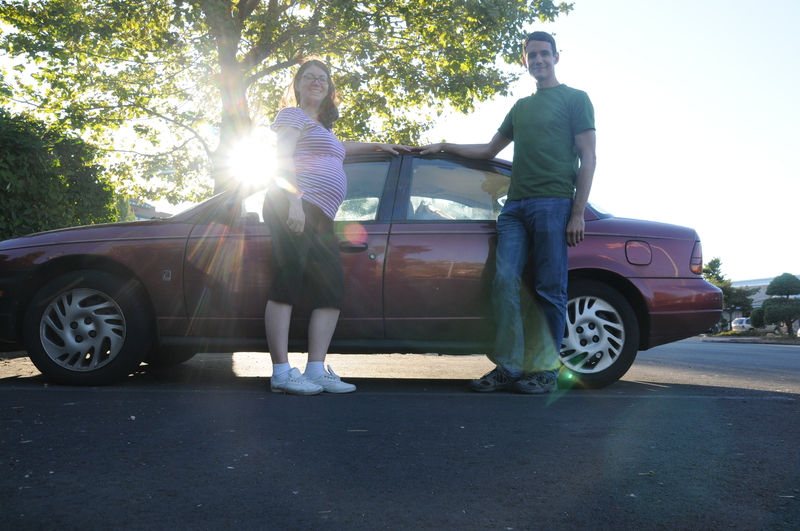 We passed into Oregon and had dinner, and then drove another hour to a motel in La Grande for our penultimate night. On the way we apparently drove onto Mars. This was our final leg. It was also our shortest driving time–less than five hours. 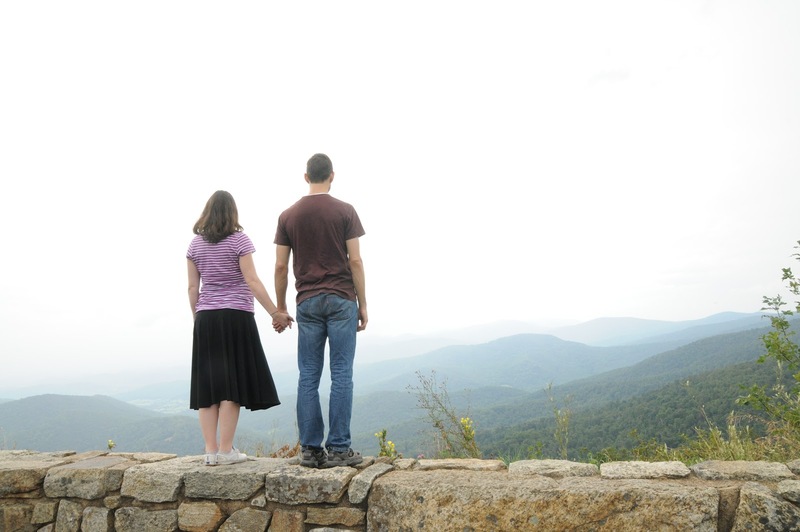 So we purposely had a leisurely morning and figured we’d stop along the way. There was actually some kind of Oregon Trail Pioneer Park soon after we started, but unfortunately it was closed. By this time we had come far enough west that we were out of Martian country and back into trees, at least for a little while. We were still on I-84, which we’d picked up before Boise the day before. 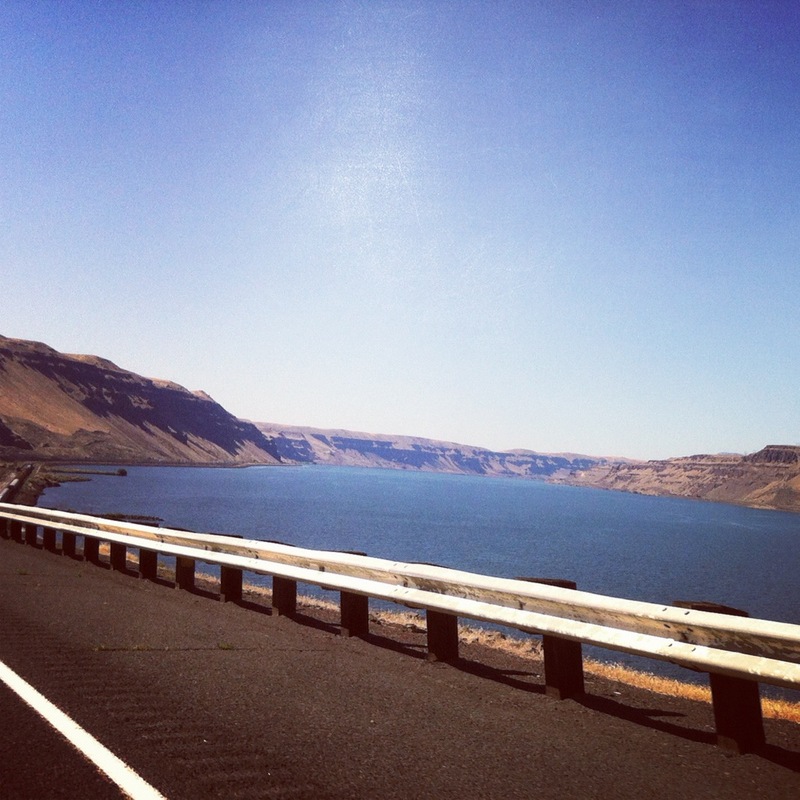 That freeway actually follows the Oregon trail at a northwestern angle and meets up with the mighty Columbia River. This made me think about a wonderful book I read as a teenager, Sacajawea by Anna Lee Waldo. It’s a historical novel of her entire life, and it is so completely fascinating. 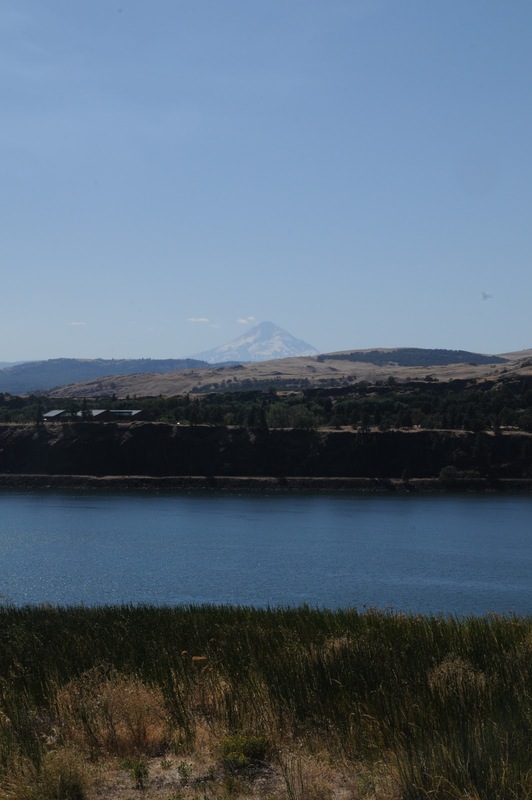 Obviously the Lewis and Clark expedition is a huge section of the book, and one of the parts I remember most is the end of their journey when they reach the mouth of the Columbia, and it’s teeming with people and fish and big water. Obviously we weren’t anywhere near the mouth, and by now the Columbia has been tamed many times over by dams. But every time I see it, I think of what the river must have seen and wish I could see it like that. Anyway! It was also exciting to reach the Columbia because it meant we were that much closer to our end point. 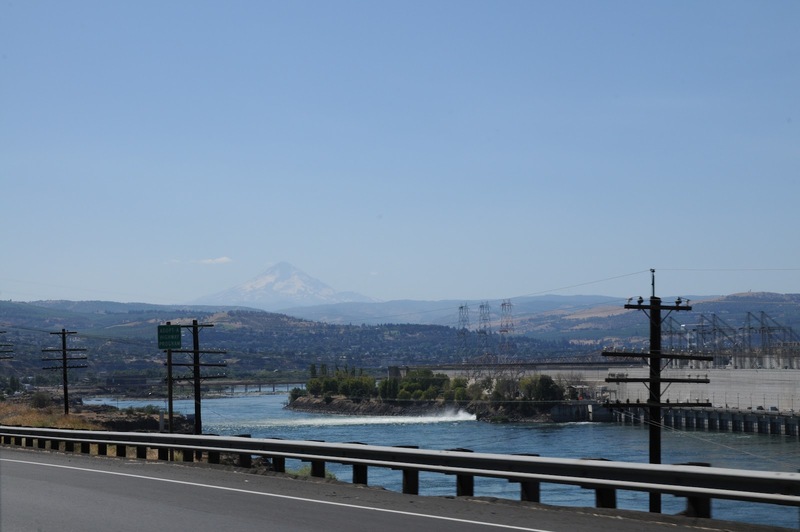 And then Mt Hood appeared! I love mountains, and Mt Hood is an especially pretty one (though of course Mt Rainier is always number one in my heart). And the combo of mountain and river made me quite happy. 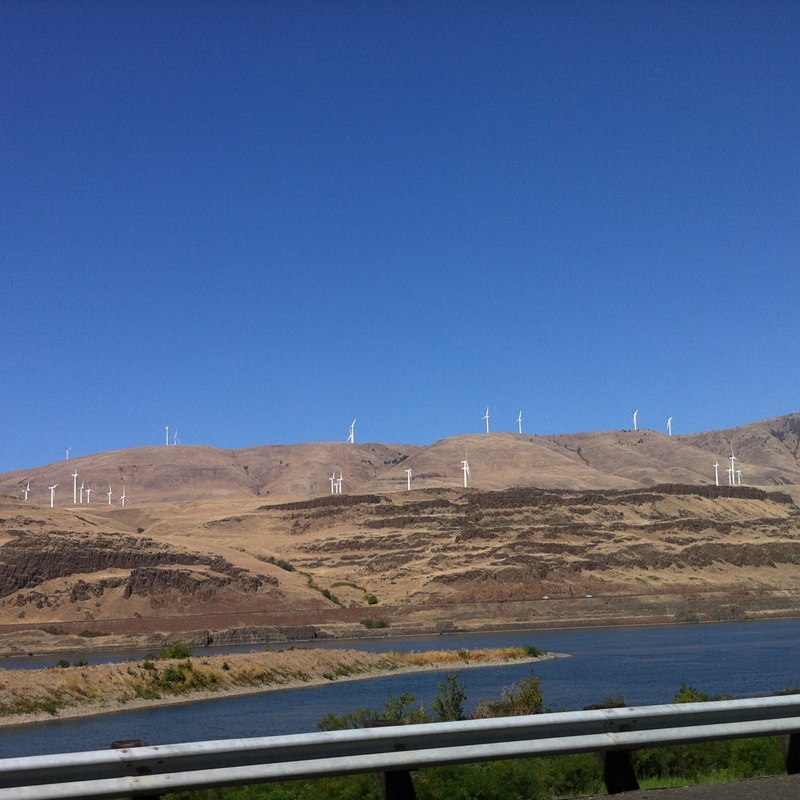 Add to that the lines of wind turbines along both sides of the river, and I was enthralled. 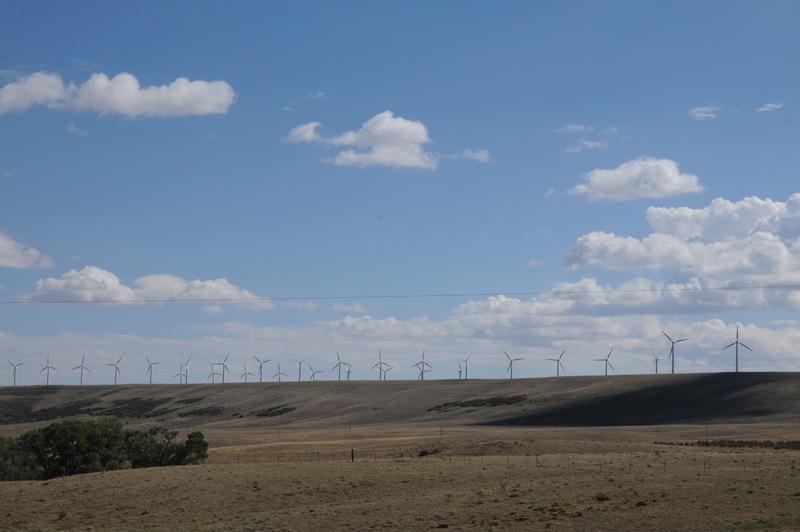 We saw wind turbines in Iowa, Illinois, Wyoming, and now again in Oregon, and every time I was struck by how beautifully elegant they are, and how exciting it is that people are harnessing nature’s power without pollution. Even better that it’s happening both on land already in use (farms/fields–turbine footprints are quite small!) and on land that seems to useless. It really adds something to the landscape. I hope all the states continue to grow their wind farms! We arrived in Portland before 5pm. It was a Tuesday. We checked into a hotel for two nights, since our things wouldn’t be arriving until Thursday. Though it was exciting to reach our destination, I was mostly sad to see the end of our adventure. This whole thing was a transition into this new life, a middle ground of being of nowhere, and arriving in our new city meant that it was time to face the reality of all that’s coming, and a new kind of permanence. 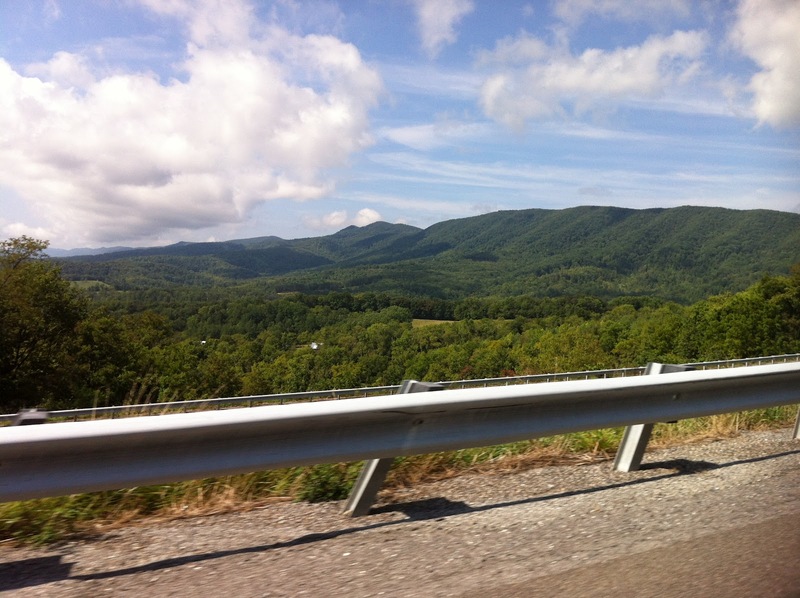 Cross Country Road Trip Leg 7: National Parks!! 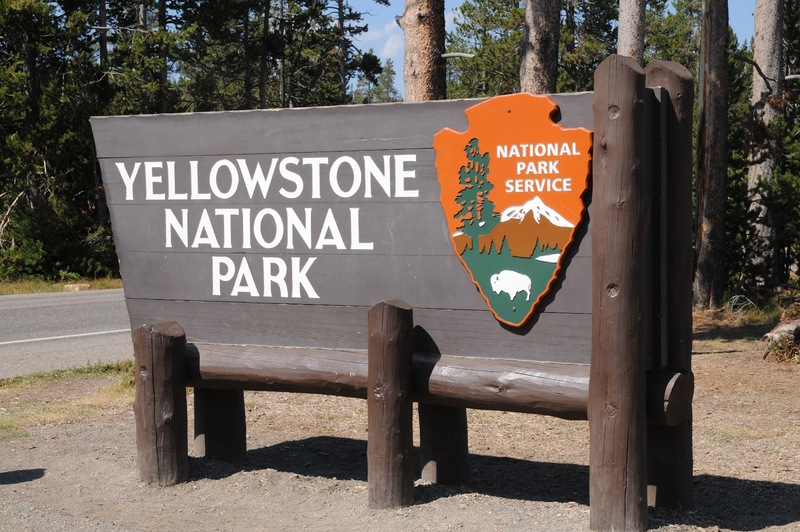 This was the leg I was looking forward to the most, and one of my biggest reasons for doing the cross-country drive in the first place–Yellowstone! Mister M had never been (I’ve been through I think three times? 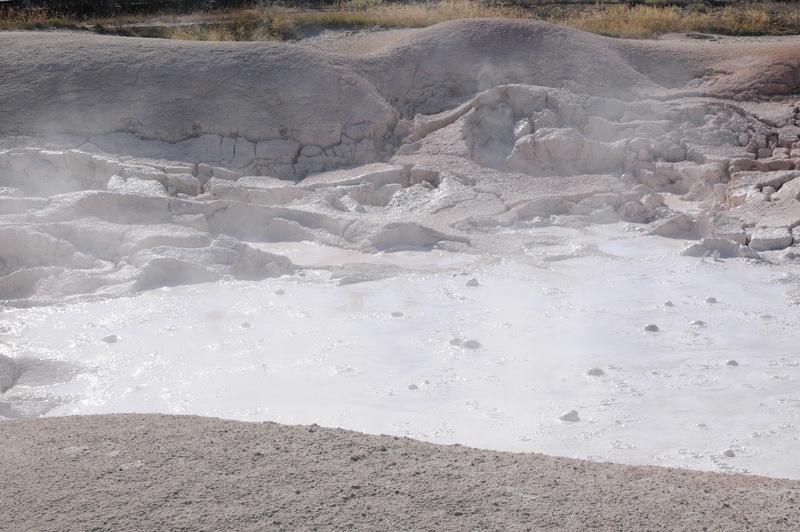 The last one was a half day on my 2005 cross-country drive), and I have this much nicer camera now, and who knows when we will next be able to visit this kind of natural wonder. So we got up early, had breakfast (one of the best features of the Hampton Inn!) 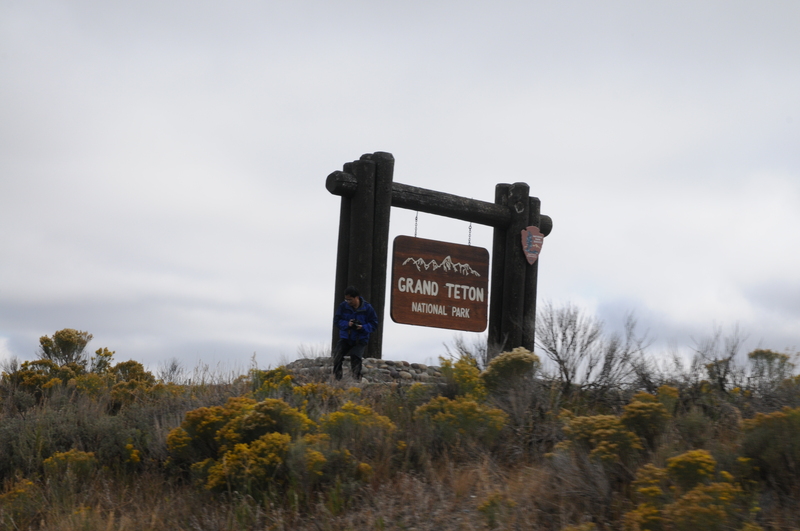 and headed out of Jackson toward the Grand Tetons. As you can see, there were a lot of low-lying clouds in the morning. We stopped by the first visitor center and looked around, got our National Parks passport stamp, and the clouds starting burning off. We stopped at several turnouts along the main road to gawk and take photos. 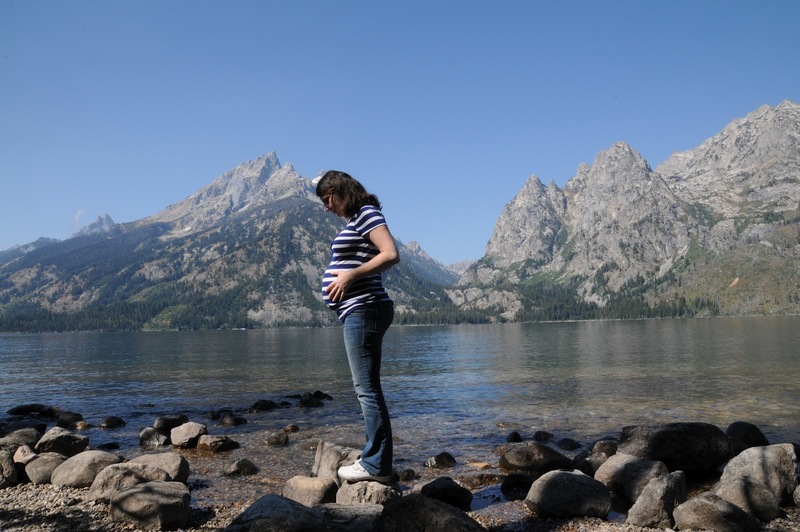 We went to Jenny Lake and followed the little trail to the lakeshore. The clouds eventually all went away and we had this to see. So beautiful! Especially after the boring/barren landscape we’d been seeing for a week! 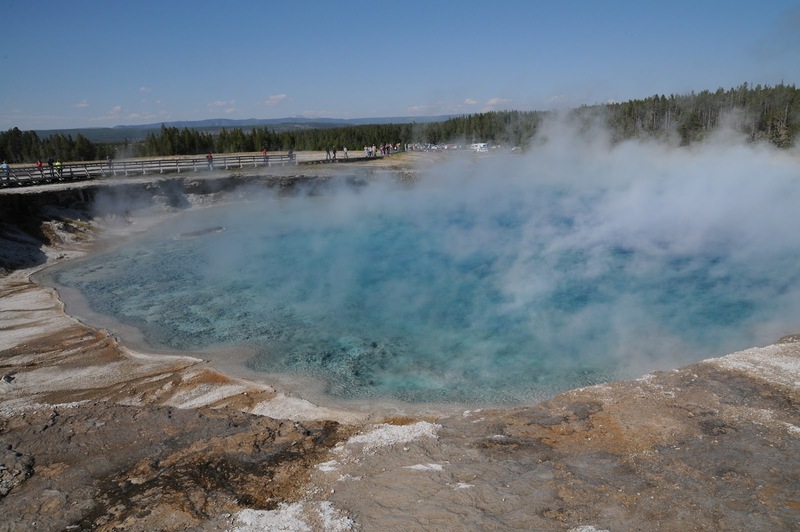 More driving north, and then, finally Yellowstone! 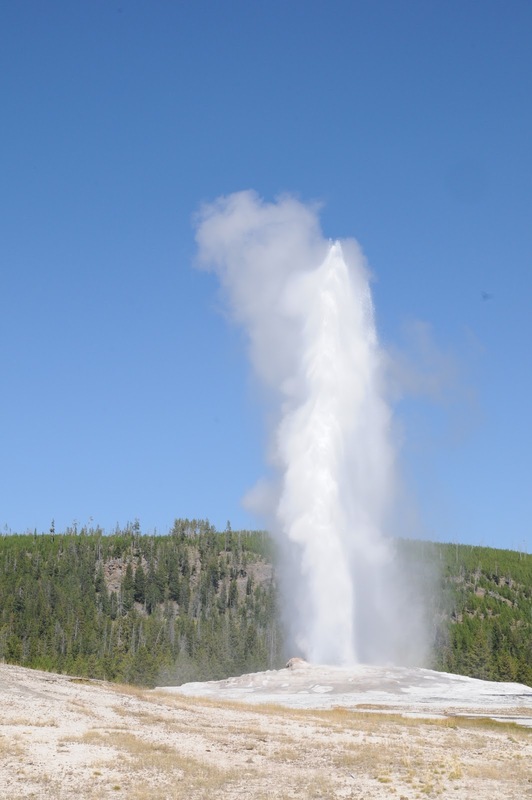 Of course we started with Old Faithful. We arrived at the visitor center at 2.30, and the sign proclaimed its next eruption would be approximately 2.40, so our timing was perfect! We found a place to watch and waited for probably ten minutes or so until the steam finally became a tall spray. It was a really short one, timewise, though–I remember them lasting a lot longer. Regardless, it’s an impressive thing to see. 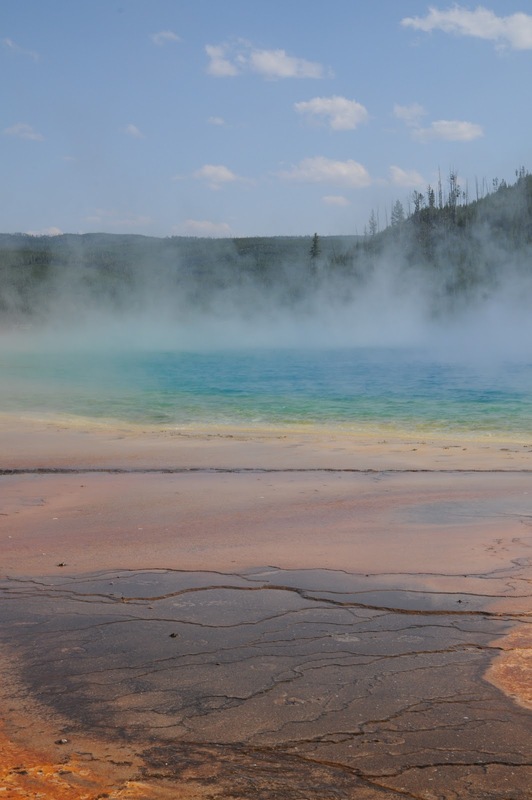 Grand Prismatic Spring–I hadn’t seen this one before. It’s the huge, multicolored one you always see in photos from above (like this), and it’s so huge you can’t see most of it from ground level. You can see and hear the water bubbling and there are huge gusts of steam that race off the surface. Fountain Paint Pots was our next stop. The bubbling and popping is so neat! 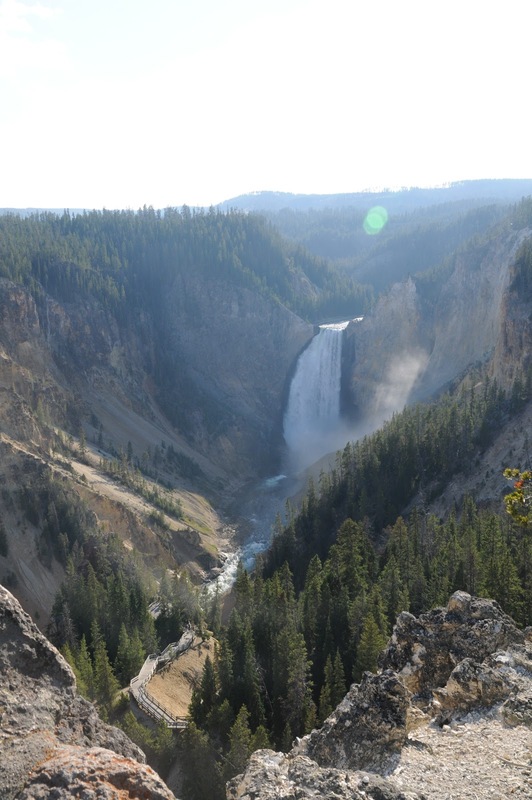 Our last stop was the Lower Falls of the Yellowstone Grand Canyon. 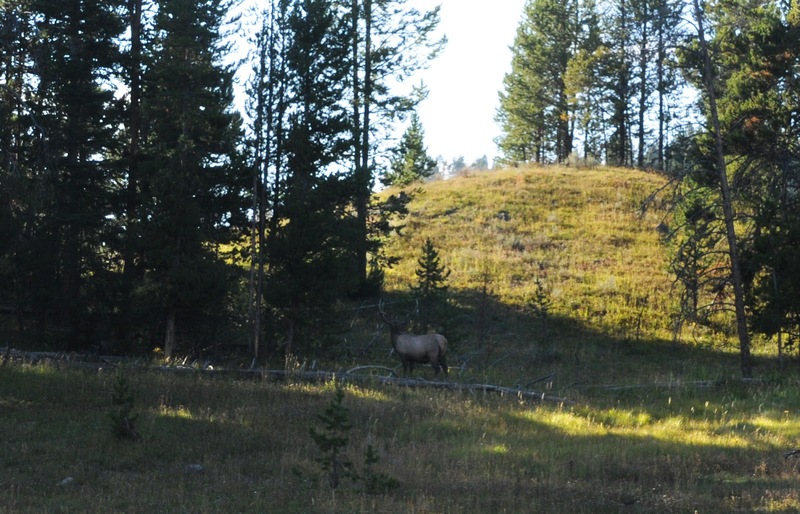 Just before that, we saw this elk grazing near a parking lot. On the way out we saw a bison! 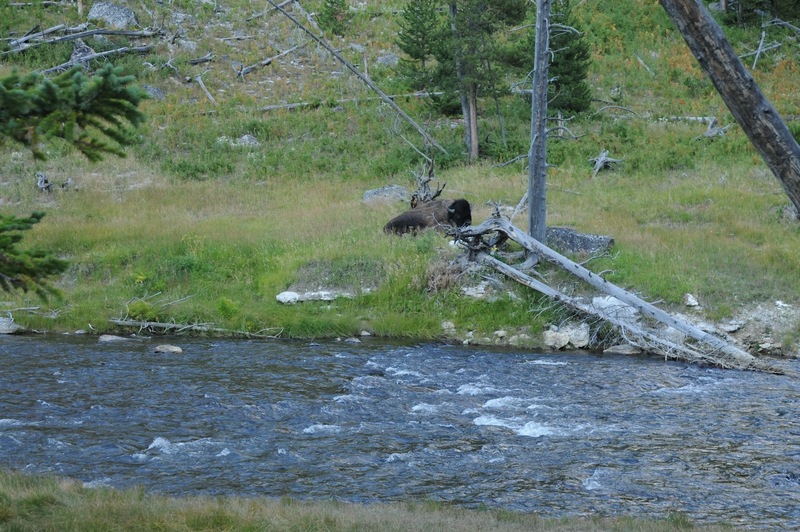 We saw another one in a meadow too, and later I think I saw a bear further up this river, and then again further on, another bison and another elk grazing in a meadow. Earlier in the day, two huge deer leapt across the road in front of us. We exited the park around 8pm (after a 45 minute traffic jam, probably caused by those animals either crossing the road or causing the drivers to stop and gawk), which was later than we’d planned. But the time was so worth it! 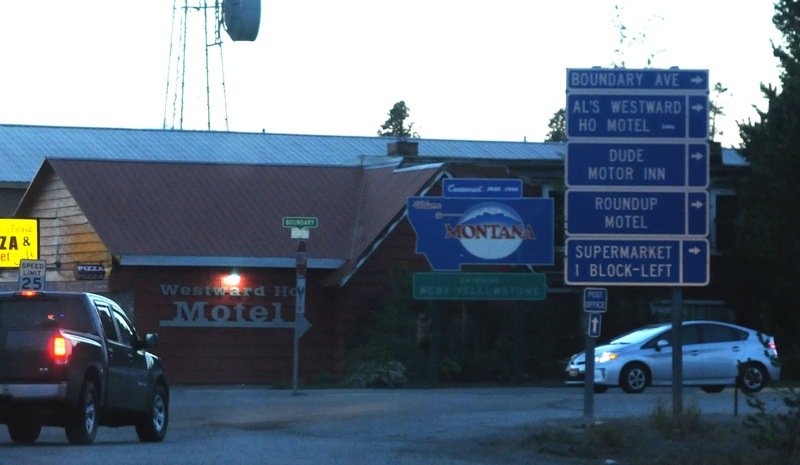 We ate dinner in West Yellowstone, which is just over the Montana border. 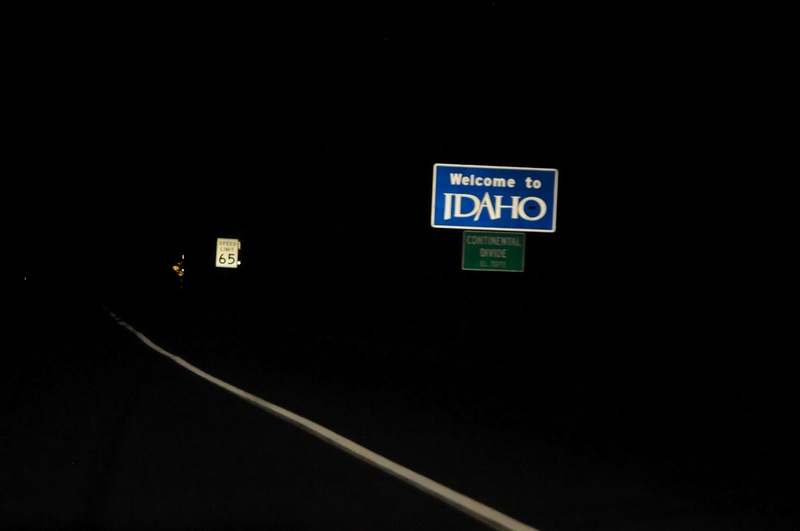 Then Mister M drove fast along the dark roads to Idaho Falls for the night. It was the longest day we had, though it was the fewest number of miles, and it was definitely the most naturally fascinating! 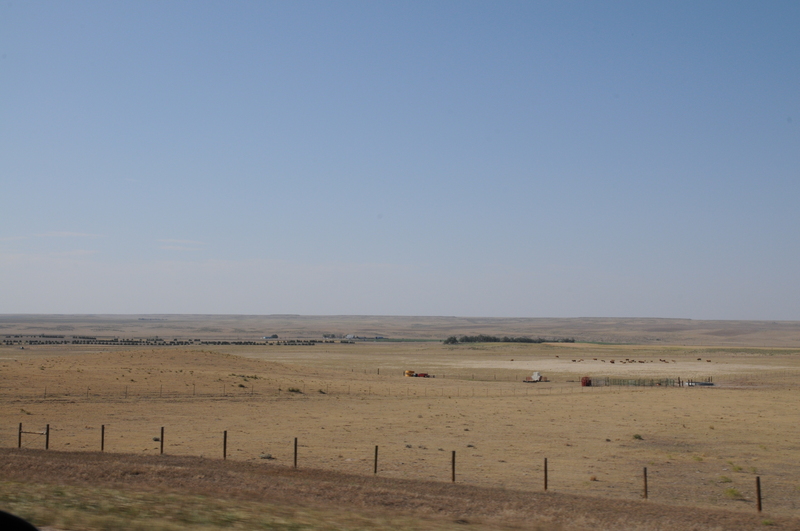 So for Leg 5, Nebraska started off with some corn, but on flatter land, and then the land turned to scrubby ranchland, and then to scrubby wasteland of nothing at all. It was nearly 100 degrees that day in Nebraska. Zero clouds to mitigate the relentless sun, and no trees or anything to provide shade. My little car finally had to protest. We had already noticed the coolant temp gauge had gone up from a quarter to a half, but it hadn’t gone anywhere near the red zone. However, eventually the overheat light came on. Still no red zone, no steam or smell coming from the hood. I tried not to panic. Mister M read the manual and it said to stop driving immediately. Of course I couldn’t do that, as I was on a freeway in literally the middle of nowhere. 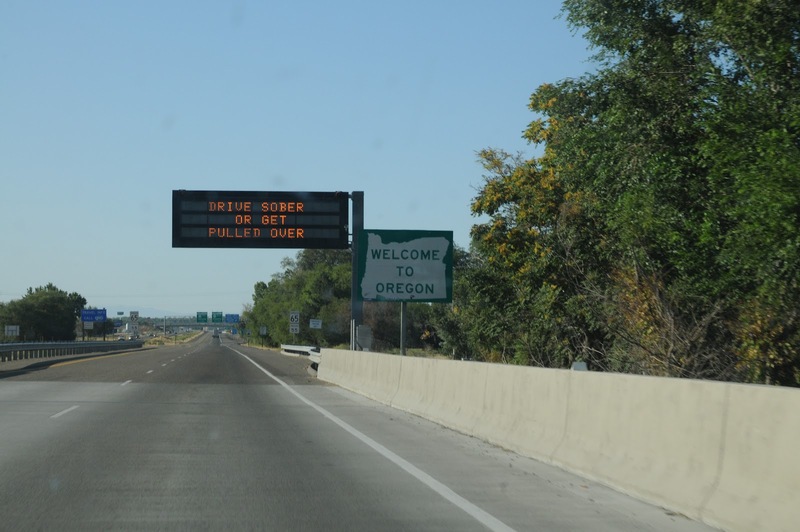 Fortunately, the exit for Potter was only a couple miles down the road. We turned off the AC and pulled into a service station. The light went off and we ended up staying there for about half an hour to give the car some rest. We consulted quickly with the technician and he said it was probably ok to keep going. 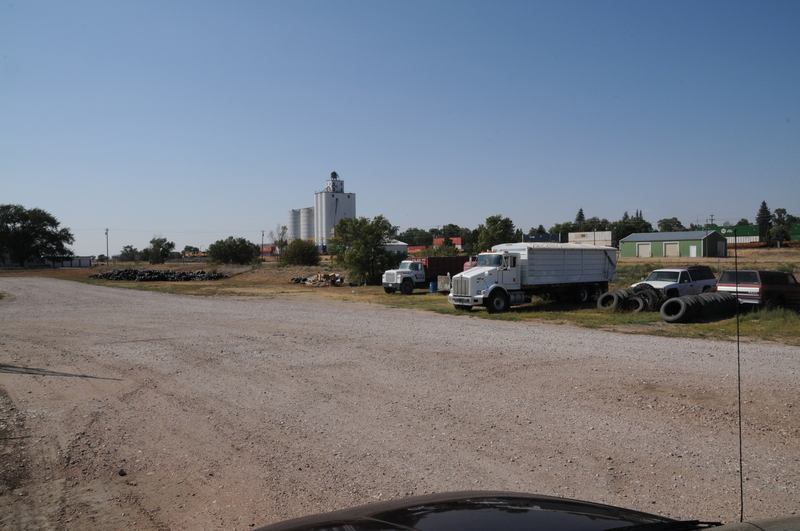 It was eighty miles from Potter to Cheyenne, where I’d already called a Midas. Nebraska’s speed limit is 75mph, which is awesome, but for that eighty miles, I stayed between 60-65, and we kept the air-conditioning off, the heat up, the windows down. The harsh plains wind blasted my left ear as I made myself stay calm. No warning light came back on, the coolant gauge stayed about the same. We made it safely to Midas. I had them do an oil change and a coolant flush. I hadn’t added any coolant in who knows how long, or a coolant flush. This is a bad job by me, and it made me a little scared and very grateful that my little car had made it so far without any problems. The Midas guys in Cheyenne were fantastic. We actually went to a second location after the first was done, so they could fix the gasket that was still leaking. (This was the THIRD TIME I had paid to fix the same leaking gasket! Gah!!) So it was another chunk of money, but well worth it. Now I knew the car was good, functioning the way it needed to, and I felt safe continuing on the journey. But even better than that was a new friend I made there. The resident kitty walked in to the waiting room and after less than a minute of walking around and meowing at us, climbed up on my lap, padded up my belly, and started kneading and purring. She was so soft and cuddly and friendly! I loved her! That night we drove on to Laramie, with a full moon and downright chilly air. What a relief to be out of the hot midwestern sun! 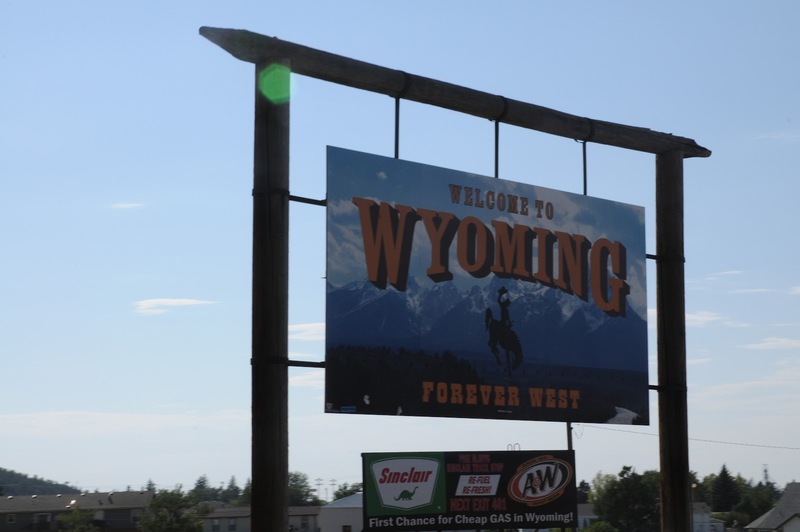 The best thing about Wyoming was that it was blessedly cool. Look at those beautiful clouds! We hadn’t seen clouds for almost a week at this point. 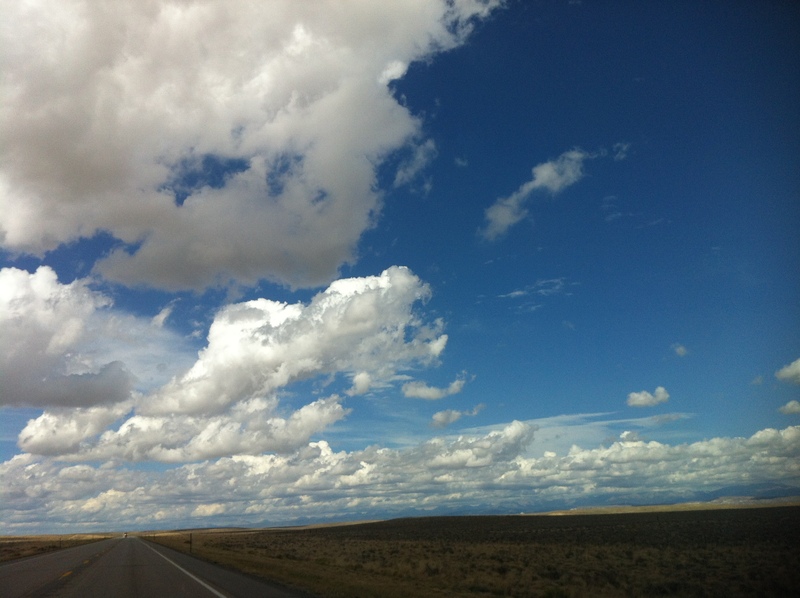 Wyoming definitely has some big-sky country to it. Also, most of it is completely and utterly empty. We did drive past this huge row of wind turbines set along a ridge. Gorgeous! 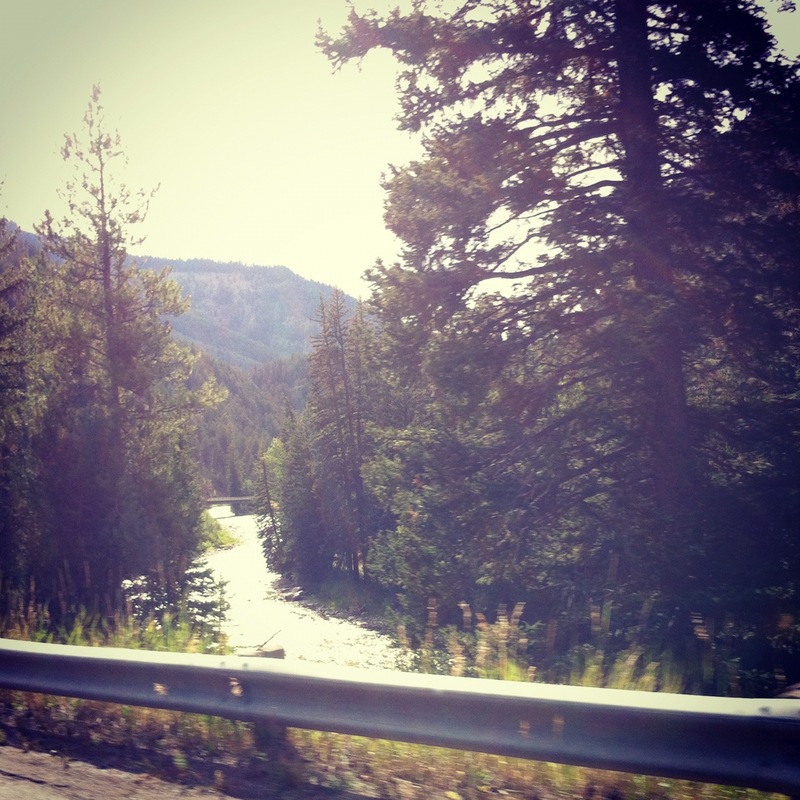 Finally we entered the Bridger-Teton National Forest and feasted our eyes on GREEN! We arrived in Jackson nice and early. Because it was Labor Day weekend and also it’s just a busy place, we decided to book a hotel a couple days in advance, and pay full price. 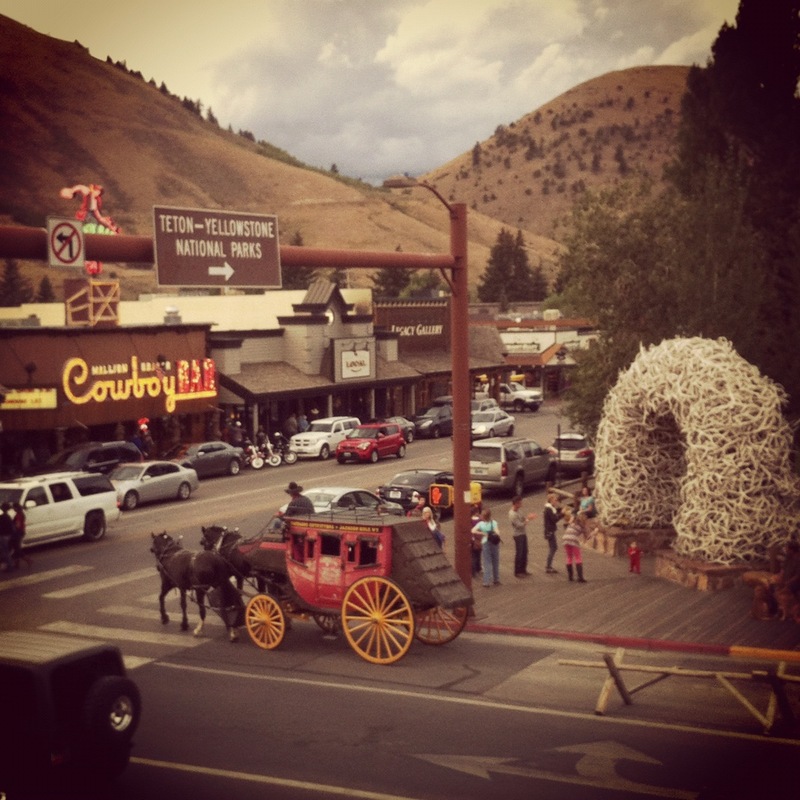 We used Priceline for almost every other night (or a cheap motel a couple nights), but there was no way that we wanted to risk that in a place as popular and limited as Jackson. We stayed at the Hampton Inn, which became my favorite hotel this past year with all of my work trips. 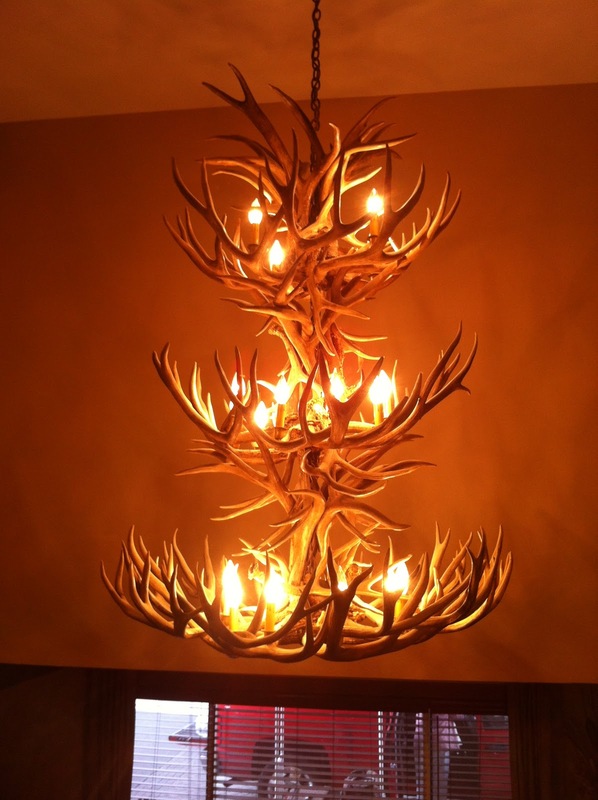 It was charmingly western–check out this fabulous antler chandelier! We had plenty of time to walk around the town square (which is pretty much all there is to see of Jackson) while it was still light out. We grabbed a drink at the Million Dollar Cowboy Bar and took pictures of each other sitting in the saddle barstools. There’s also a display case of a stuffed bear that some badass killed with his hands and TEETH. Good lord! We were quite tired and went to bed early in preparation for a big day of national parks the next day! Driving out of Ohio in the morning was pretty. 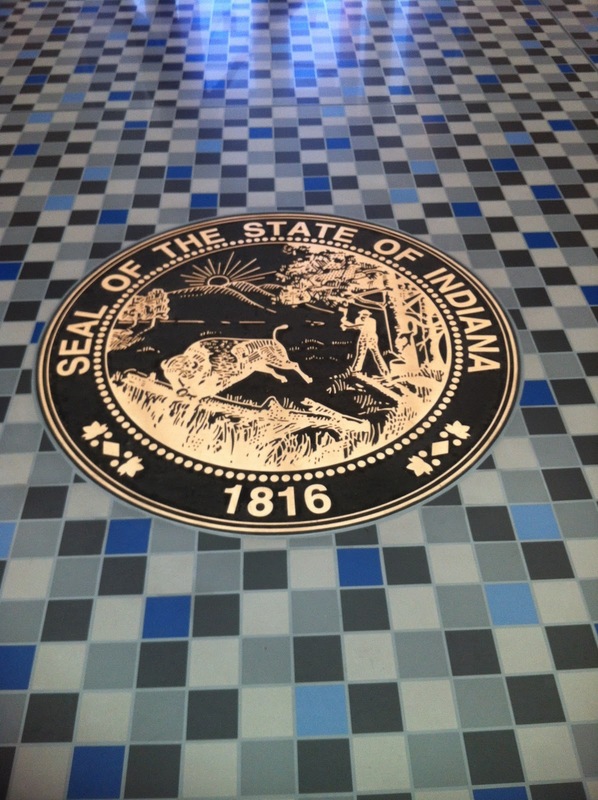 We hit Indiana. 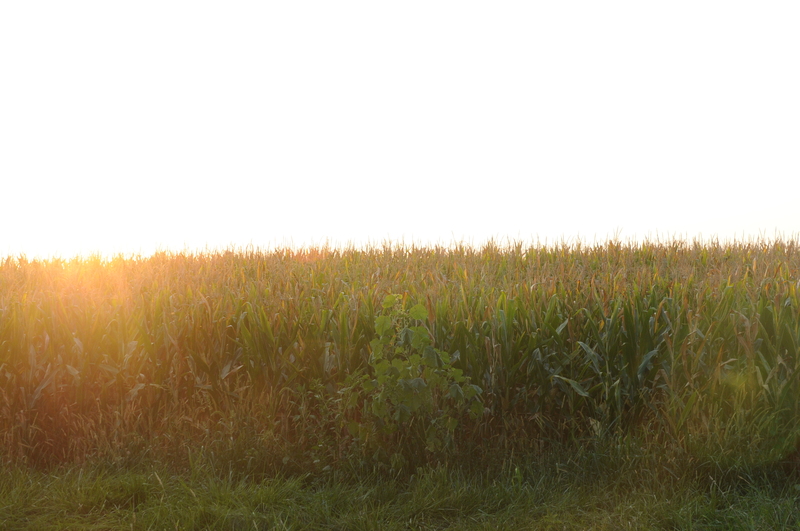 Nothing much there but corn. 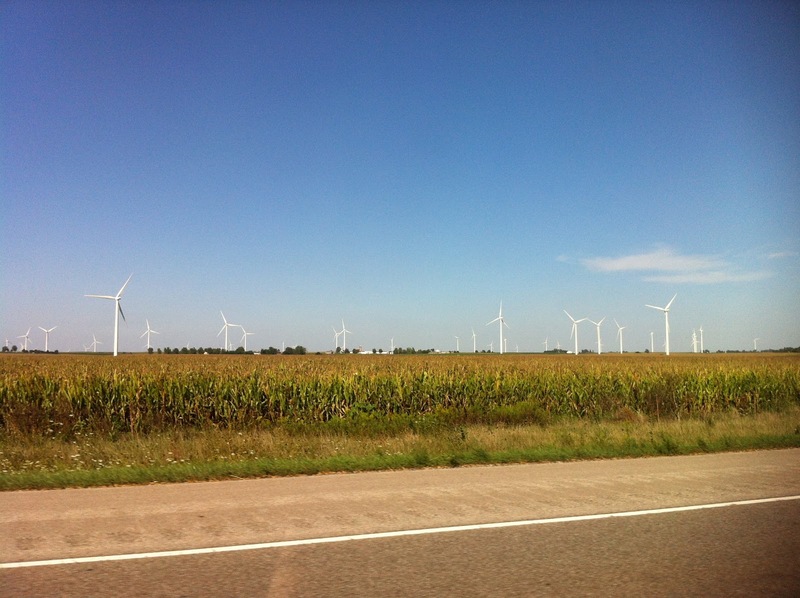 In Illinois we saw our first wind turbines. They are so pretty and elegant! Plus so good for the environment. Well done, states who have lots of wind turbines in their fields! 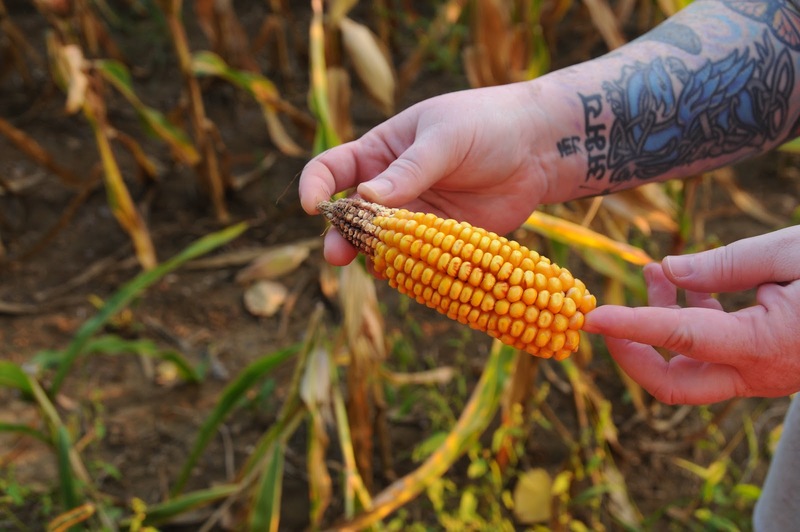 Speaking of fields, as you probably know, this has been a terribly hot and drought-ridden summer throughout the bulk of the US, especially the parts that are covered in corn and soybean fields. 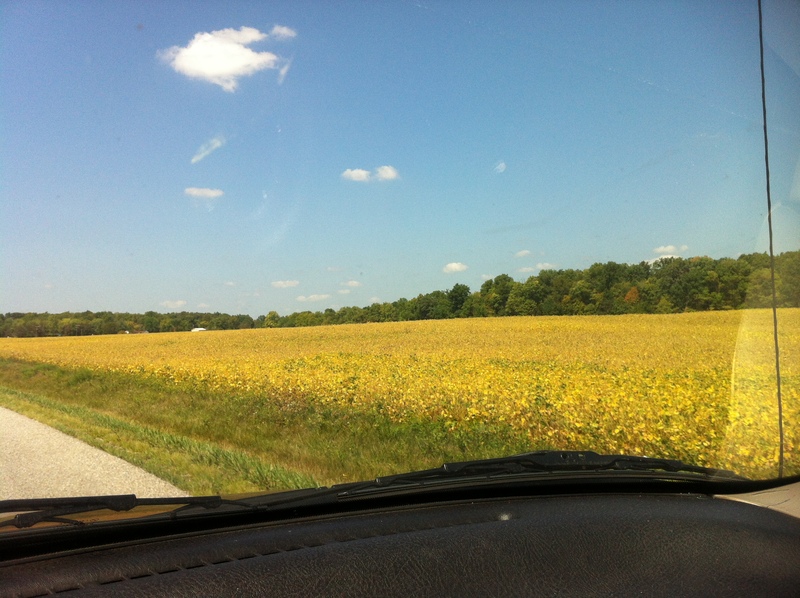 The soybeans were still pretty green, but most of the corn was dying or totally dead. Here’s my cousin showing a stunted, dried ear from the field across the street. 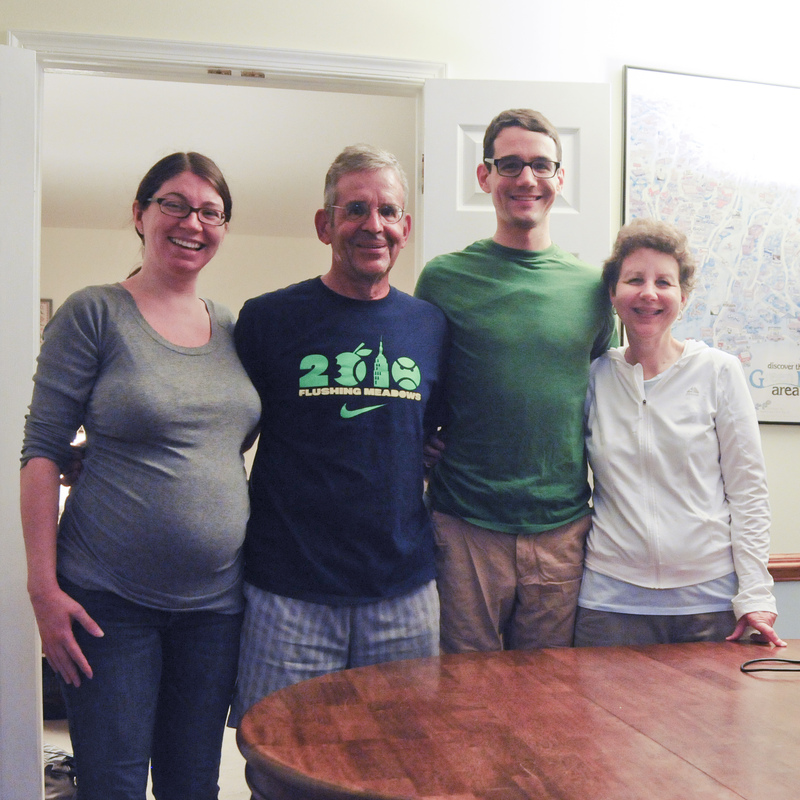 We spent two nights with my aunt and cousins, hanging out and talking. 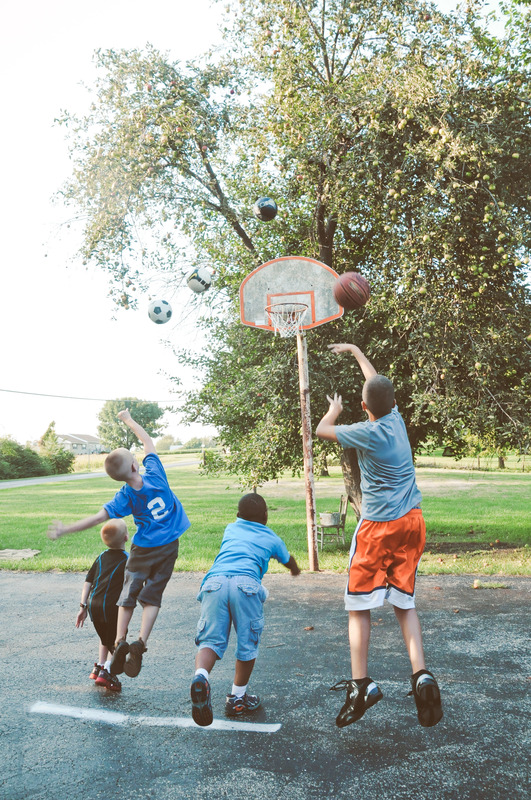 Got to know the four boys that my cousins have–they are great kids, and wow, they never stop moving! 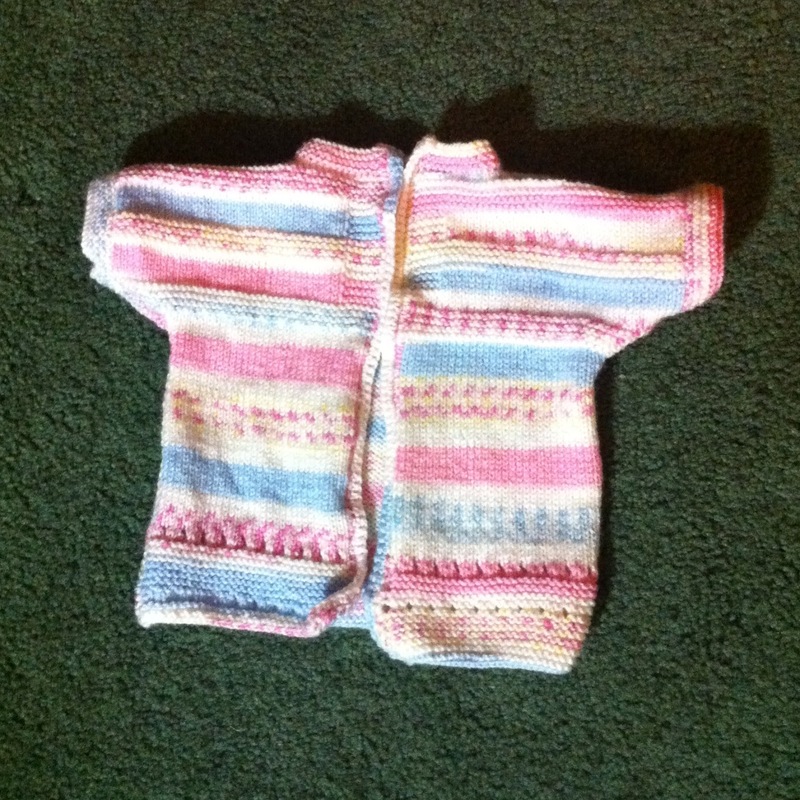 I also finished the baby sweater I began in July at my other aunt’s house in Illinois. I’m going to say it again, because it’s that big of a deal. I FINISHED A SWEATER! It’s tiny and full of mistakes (it’s supposed to be long-sleeved, for one), but I finished the damn thing! This is a huge milestone in my crafting ‘career’! This is not necessarily for one of mine; I don’t even know how big a baby this would fit. Oh, and this was the first time I had to pick up stitches to create cuffs–that made me nervous, but Mister M’s mom is a knitter and she helped teach/talk me through it when we were there at the weekend. Anyway, having two different sets of family rest time on our roadtrip was wonderful. 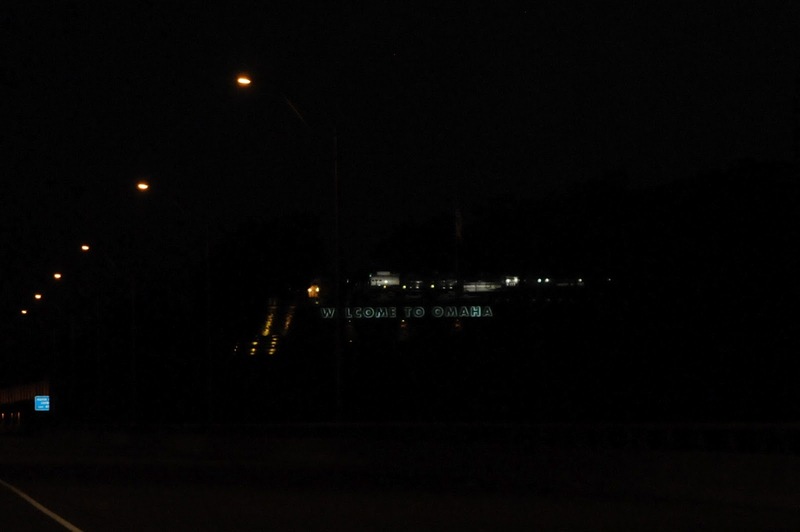 After a short return after a forgotten item, we drove northwest and finally hit I-80 West into Iowa. 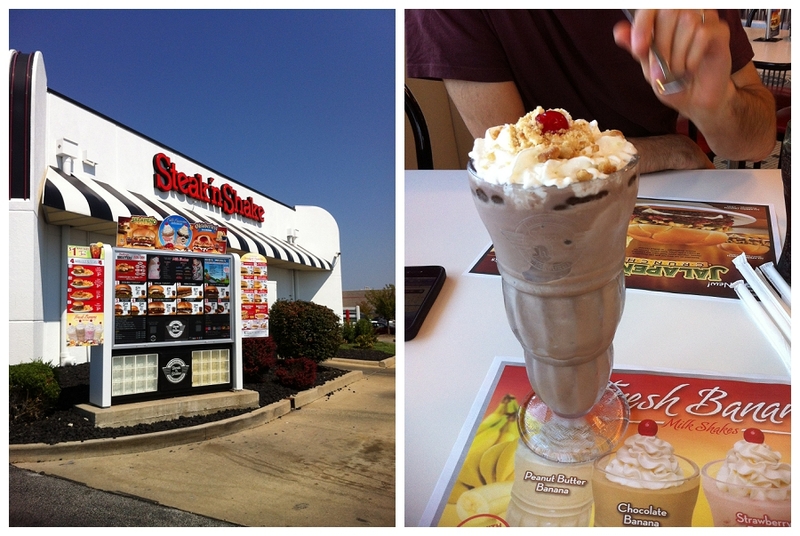 We pulled off just over the border to go to our first Steak n Shake! I had this ridiculous s’mores shake. 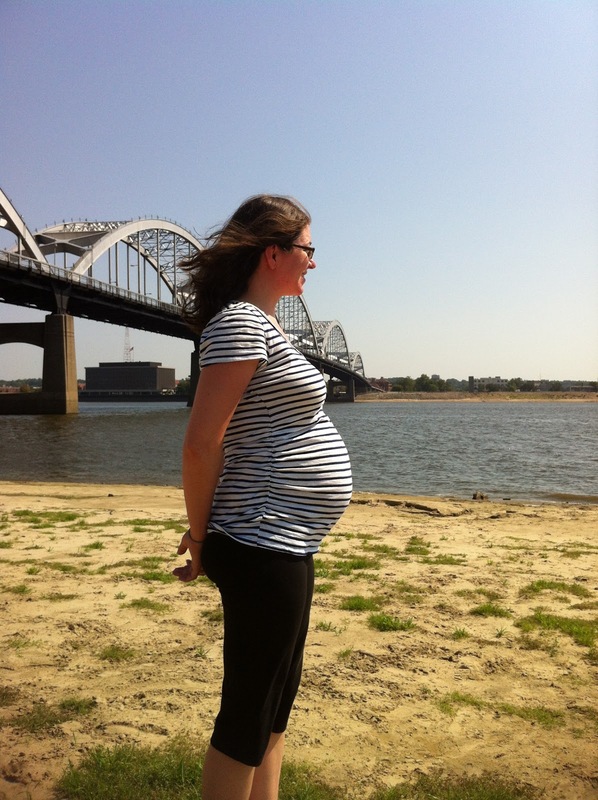 Following lunch, we went to find the Mississippi River. This town didn’t have a terribly picturesque riverside park, but it sufficed for our photo purposes. 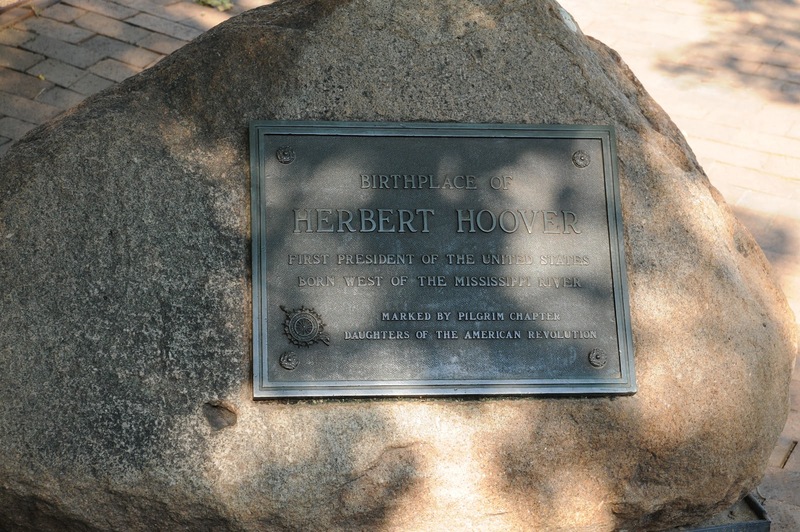 Anyway, later on, we stopped by the Herbert Hoover National Historic Site. Mostly to get another stamp in our National Parks Passport. But we stayed for a few minutes and looked at some of the buildings. 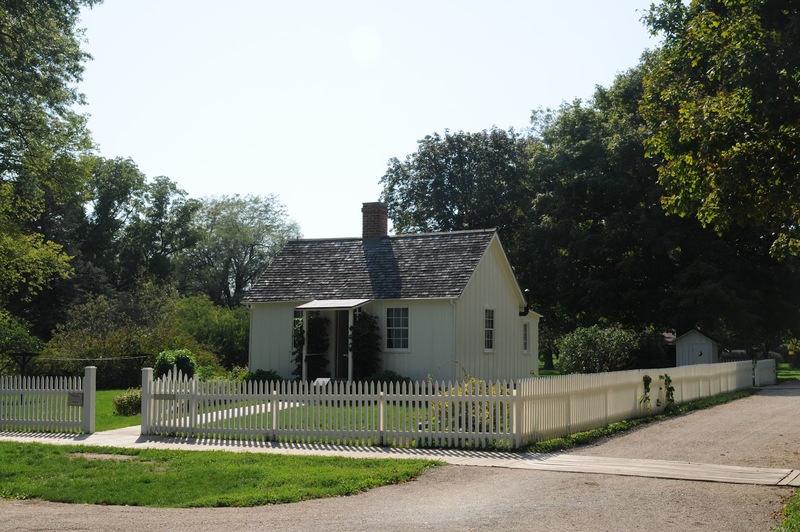 Parts of the whole village are preserved or rebuilt, which is kind of neat. Here’s a blacksmithy built in the 1950s with materials from the 1870s. 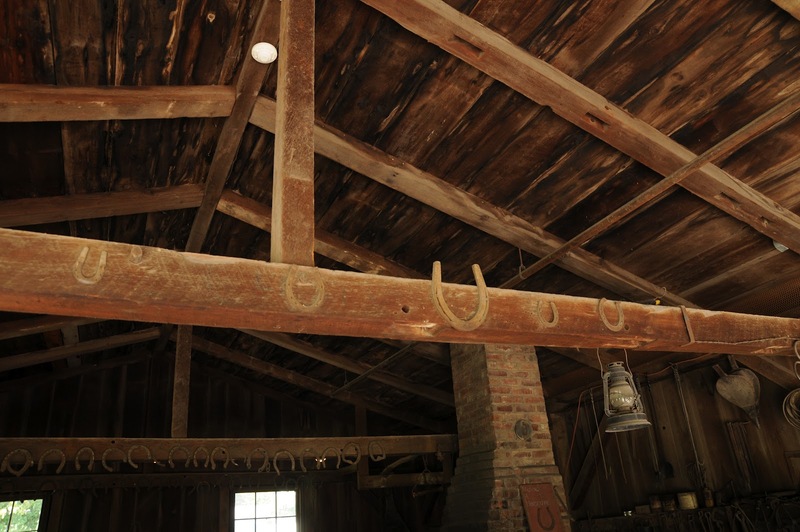 (Hoover’s father was a blacksmith.) Check out the different size shoes–far left is a donkey, second is a ‘normal’ sized horse or pony, and third from left is a draught horse! 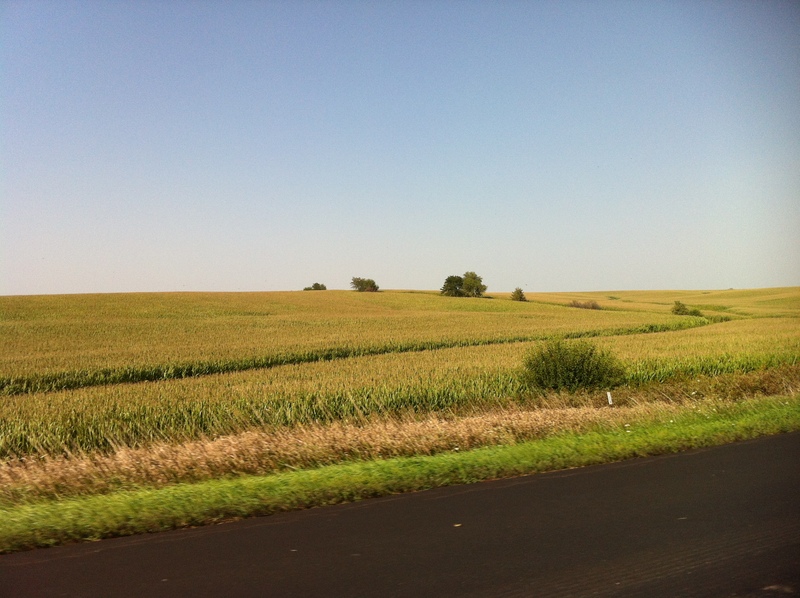 Iowa was all corn in rolling hills. It was actually quite lovely. We left at 5. With a seven-hour drive ahead of us. 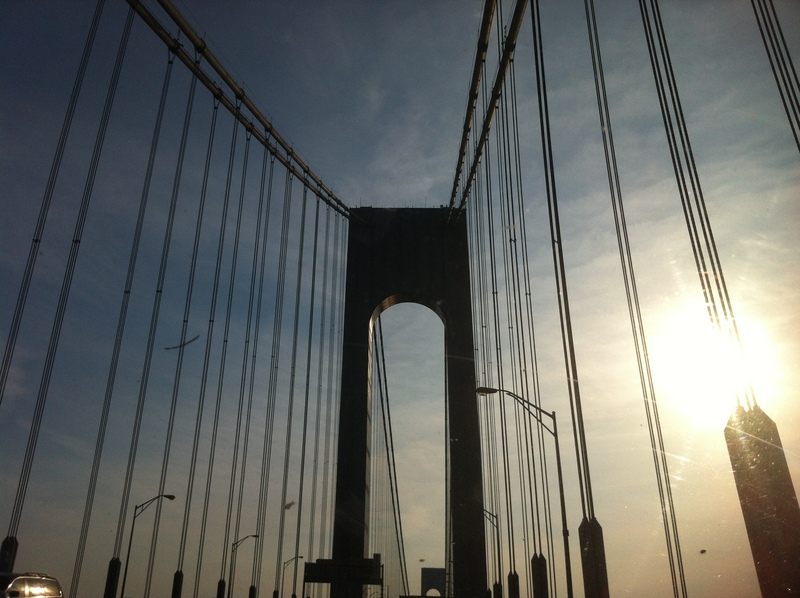 It was a beautiful last trip across the Verrazano Bridge. Because only a crazy person would attempt to go through Manhattan on a Friday evening to one of the tunnels. 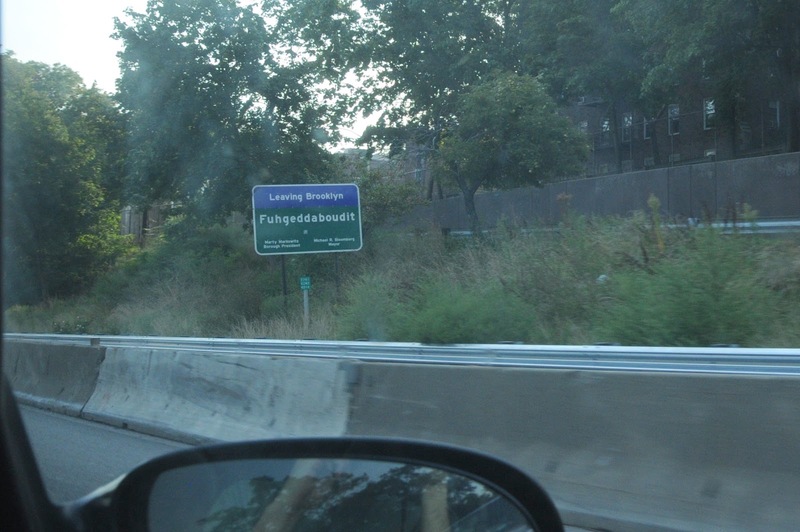 So we stayed south and crossed Staten Island instead–it was slow, of course, but actually not nearly as bad as it could have been. 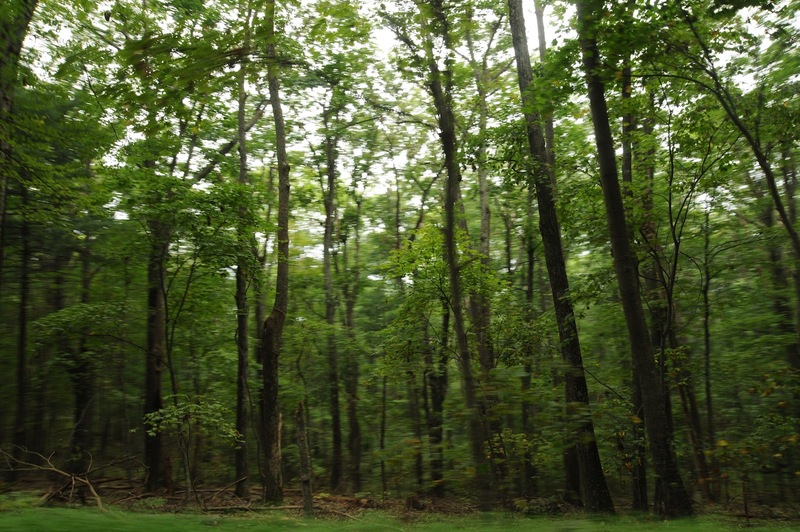 We stopped in rural New Jersey for a hearty dinner, and pushed on through. It got late and we got tired, and we knew we couldn’t make it all the way. 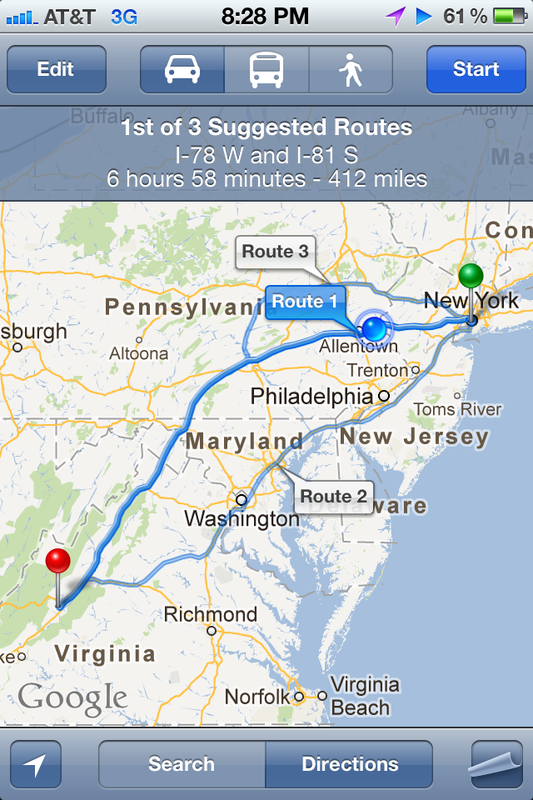 So we stopped in Northern Virginia, about two hours north of our destination. It was beautiful to get a good night’s rest. 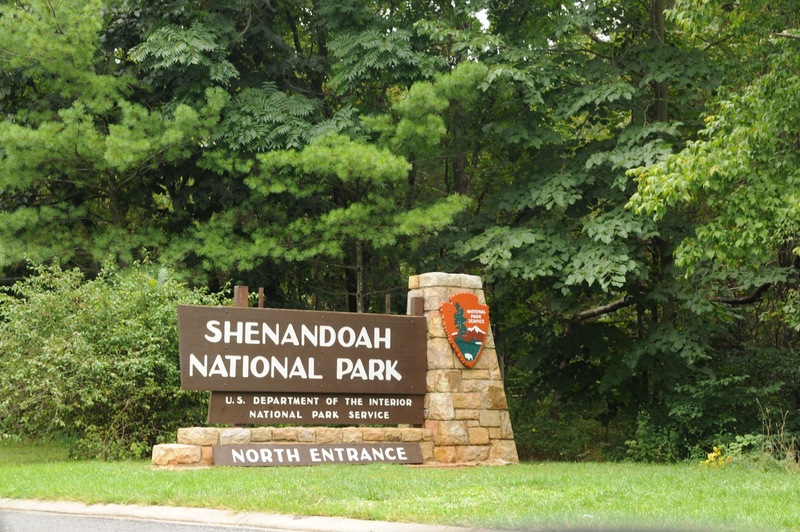 Having an extra day meant that we had time for a detour through Shenandoah National Park. A couple years ago we got one of those national park passes, and we were excited to get another stamp. 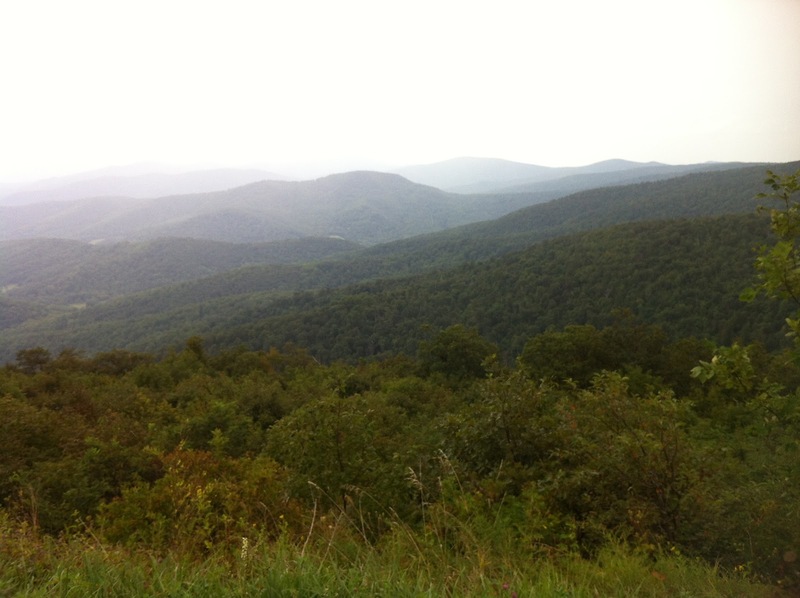 🙂 We drove for about 30 miles down Skyline Drive and enjoyed the greenery. We spent the rest of the weekend with Andy’s parents, resting and relaxing. 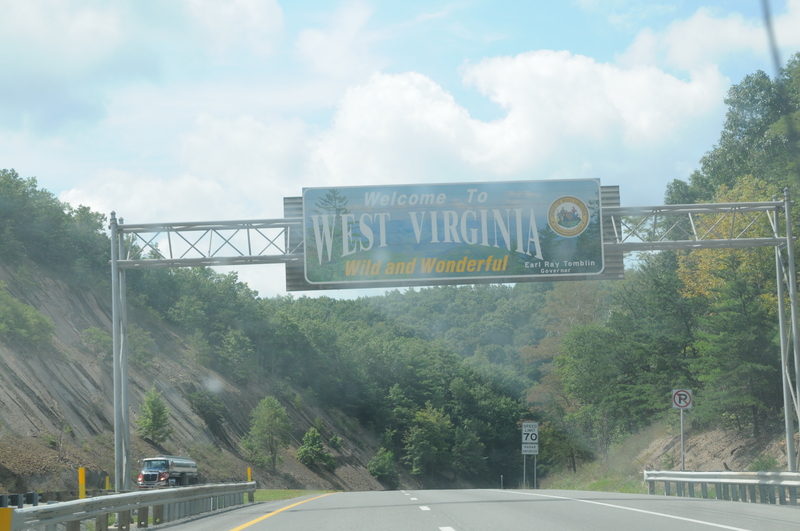 We left on a beautiful day and drove through green wooded hills in Virginia and on to West Virginia. 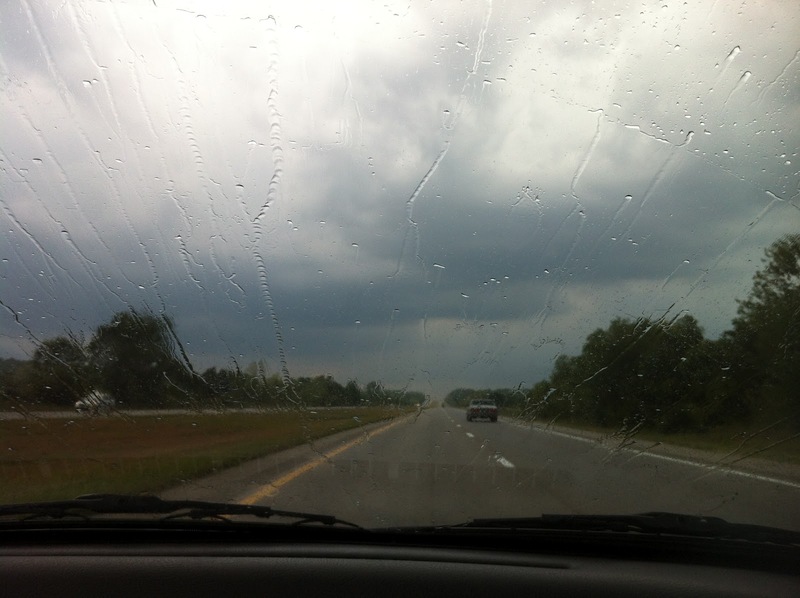 On into Ohio, where we saw the first of a million bajillion corn fields, and also the only rain we saw the entire trip. 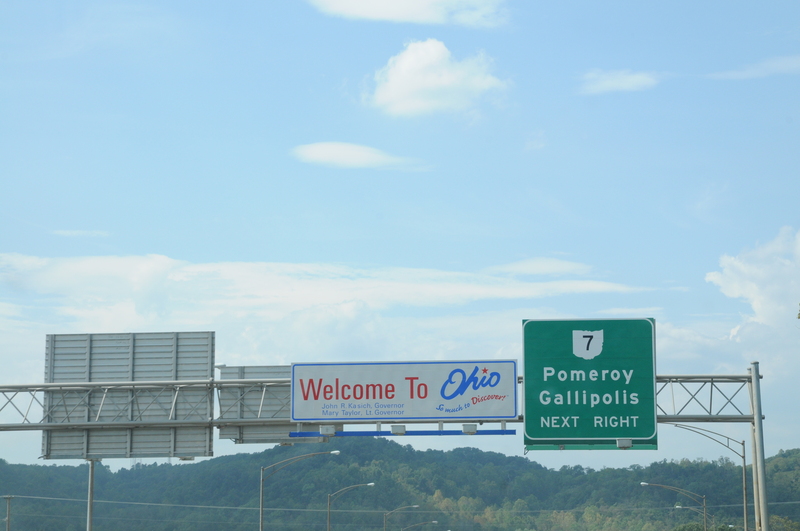 This did not surprise me, because when I drove through Ohio on my previous cross-country road trip, it rained so hard that I actually had to pull over on the freeway because I couldn’t see. This storm wasn’t nearly that bad, happily. 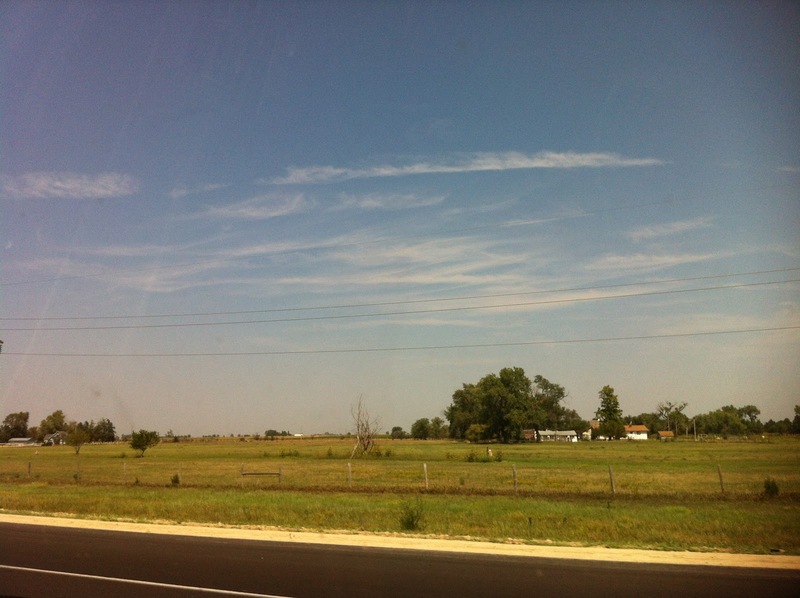 By the time we arrived in Dayton, the weather had improved. 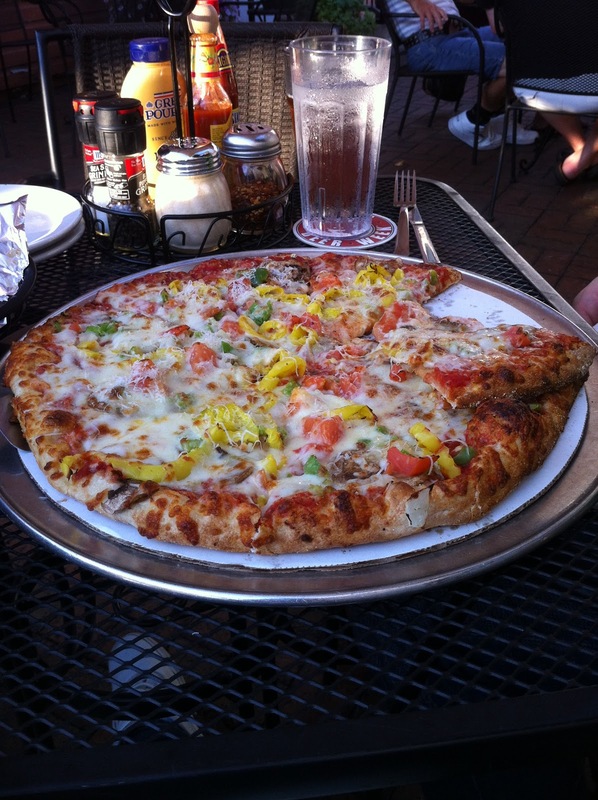 We found a local pizza place, South Park Tavern, for dinner. 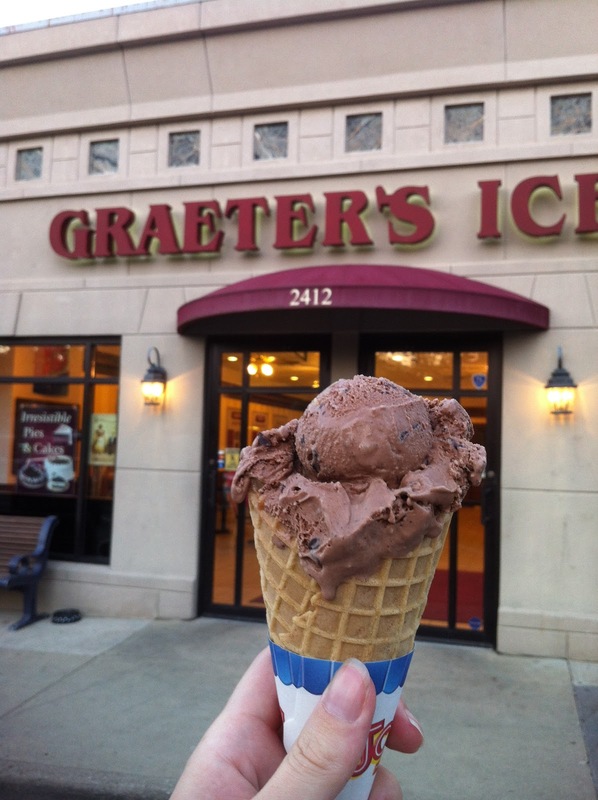 And of course I needed dessert, and a waffle cone of Buckeye Blitz really hit the spot!